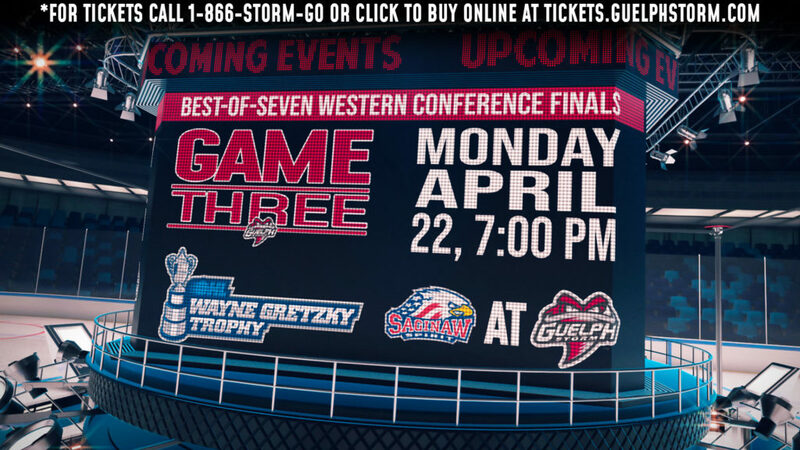 The Guelph Storm are proud to be a part of the Guelph community! Please check this page regularly for information and updates on our upcoming events as well as pictures of past events. You can also visit our photo galleries page to see even more photos from any of our community events. program, encourage healthy active living, anti-bullying and the importance of education. During the Read to Succeed and Fun Fit presentations, students have the chance to ask questions and get autographs and sometimes the players are challenged to a game of floor hockey! In addition to our school visits, Storm players also visit each branch of the Guelph Public Library to read Hockey Stories to young fans and interact with them in a relaxed setting. Kids have the oppourtunity to meet the players, get autographs, ask questions and of course, listen to some great hockey stories! During March Break, the Storm held their final Skate with the Storm of the 2011-2012 Season. Fans had the chance to Skate with their favourite Storm players following the game on March 14th, 2012. Ryan Horvat signing a young fans helmet! Francis Menard signing a program! Top Prospect Matt Finn signing hockey cards for his fans! Throughout the school year, Storm players visit many elementary schools to present the Champions for Education program to students in Guelph and Wellington County. February 9th, 2012: Storm players Scott Kosmachuk, Kyle Pereira, Stephen Gaskin and Cody McNaughton wait to sign autographs for some excited students at St. John’s-Kilmarnock School. Kosmachuk and Pereira presented the Read to Succeed program, while Gaskin and McNaughton presented the Fun Fit program. February 16th 2012: Storm players Stephen Gaskin and Zack Mitchell presented the Fun Fit program to students at St. Peter Catholic School in Guelph. Mac Nichol and Garret Sparks presented the Read to Succeed program to the primary students! February 22nd 2012: Storm players Stephen Gaskin and Francis Menard present the Fun Fit presentation at Westwood Public School. Ryan Horvat, Garret Sparks and Mac Nichol presented the Read to Succeed program as well! February 23rd 2012: Storm players Stephen Gaskin and Ryan Horvat present the Fun Fit program to students at Priory Park Public School. Kyle Pereira and Brandon Foote presented the Read to Succeed program to students in Kindergarten to Grade 3. February 28th 2012: Storm Forward Ryan Horvat presents the Read to Succeed program at St. John Catholic School in Arthur. Kyle Pereira and Stephen Gaskin presented the Fun Fit program to Senior students. February 4th, 2012: The Guelph Storm and the Guelph Giants took part in their annual charity game at the Sleeman Centre. February 6th, 2012: The Guelph Jr. Storm Minor Atom A team listen to Storm Assistant Coach Chris Hajt explain the drills during their Coach4Food practice at the Sleeman Centre. February 9th, 2012: The Guelph Jr. Storm Minor Peewee A team listen to Storm Assistant Coach Chris Hajt during their Coach4Food practice. The Minor Peewee A team raised 4,341.13 pounds of food for the local food bank! February 16th 2012: Ryan Horvat helped lead the Coach4Food practice for the Guelph Jr. Storm Minor Peewee AA team. Storm Assistant Coach Chris Hajt as well as Storm players Cody McNaughton, Kyle Pereria, Francis Menard and Zack Mitchell were on hand to lead the practice. February 23rd 2012: The Guelph Junior Storm Peewee AA team took to the ice at the Sleeman Centre for their Coach4Food practice. Storm players Ryan Horvat, Francis Menard, Zack Mitchell and Kyle Pereira led the final Coach4Food practice of the 2011-2012 season with Storm Assistant Coach Chris Hajt and Guelph Gryphons Head Coach Shawn Camp. February 20th 2012: Zack Mitchell signs an autograph at the Family Day Skate with the Storm. In it’s 8th year, the Westwood Cup was played at the Sleeman Centre for the first time on February 27th. Students from Westwood Public School challeneged members of the Guelph Storm to a game of hockey. The game ended in a 19-19 tie. Storm players Brock McGinn, Zac Leslie, Ben Harpur, Spencer Turcotte, Daniel Poliziani and Justin Auger represented the Storm in the annual match up! January 26, 2012: Guelph Jr. Storm Novice AA players and coaches, with Storm players Cody McNaughton, Brock McGinn and Assistant Coach Chris Hajt listen to General Manager Mike Kelly explain the practice drills at the first Coach4Food Practice. During the school year, Storm players like to surprise the hardworking Safety Patrols at their Pizza Lunches! January 17th, 2012 – Storm Players Andrey Pedan, Stephen Gaskin, Cody McNaughton and Brandon Foote surprised the Safety Patrols at Sir Issac Brock Public School at their Pizza Party! These Safety Patrols won the pizza lunch for being the loudest school at the Storm Safety Patrol Game last month! Congratulations, Sir Issac Brock Public School! January 10th 2012: Mac Nicol and Daniel Poliziani read Hockey Stories at the Westminster Branch of the Guelph Public Library! January 24th 2012: Daniel Poliziani and Justin Auger sign Autographs after reading Hockey Stories at the Bullfrog Mall Branch of the Guelph Public Library! January 12th 2012: Scott Kosmachuk, Jason Dickinson, Zac Leslie, Hunter Garlent, Spencer Turcotte, Garret Sparks and Daniel Poliziani were challenged to an intense game of Floor Hockey by the Special Olympics National Champions! December 6th 2011: Storm Players Patrick Watling, Tanner Richard, Francis Menard and Ryan Horvat presented the Champions for Education program at Gateway Drive Public School on December 6th! Ryan Horvat also joined in on a game of floor hockey after presenting the Fun Fit program! December 7th 2011: After enjoying a pizza lunch, students at Mitchell Woods Public School got autographs from Zack Mitchell and Patrick Watling! December 14, 2011: Stephen Gaskin and Kyle Pereira surprised the Laurine Avenue Public School Safety Patrols at their Pizza Lunch! December 1st 2011: Storm players Ryan Horvat and Cody McNaughton helped students from Tytler Public School decorate the Christmas Tree at Owen’s Corning. The students enjoyed Tim Bits and Hot Chocolate, and recieved some special presents from Owen’s Corning and the Storm! Throughout the school year, Storm players visit many schools to present the Champions for Education program to students in Guelph and Wellington County! November 16th 2011: Storm players Patrick Watling, Zack Mitchell, Kyle Pereira and Cody McNaughton travelled to Elora Road Public School where they presented the Champions for Education program. Pictured is Kyle Pereira talking to some young students before reading Brady Brady, and Cody McNaughton with Zack Mitchell presenting the FUN FIT program. November 17th 2011: Storm Players Stephen Gaskin, Brandon Foote, Ryan Horvat and Francis Menard presented the Champions for Education program to students at St. Joseph Catholic School in Guelph! November 21st 2011: Storm Players Francis Menard, Garret Sparks and Ryan Horvat presented the Champions for Education program at St. Ignatius of Loyola Catholic School in Guelph. Sparks and Menard presented the FUN FIT Program in the gym, while Horvat presented the Read to Succeed program in the library! November 30th 2011: Zack Mitchell and Patrick Watling surprised the hardworking safety patrols at Guelph Community Christian School at their pizza lunch! Throughout the 2011-2012 Hockey Season, Storm players will be reading Hockey Stories to young fans at various brances of the Guelph Public Library! November 8th, 2011: Storm Players Spencer Turcotte and Mac Nichol read Hockey Stories at the West End branch of the Guelph Public Library. November 24th, 2011: Storm Players Ben Harpur and Tyler Bertuzzi read Hockey Stories at the Scotsdale Branch of the Guelph Public Library! The thirteenth annual Served by the Storm dinner was held on November 7th,2011 at Casey’s Grill Bar on Edinburgh Road. A big thank you to everyone who came out and helped make the event such a success. All proceeds from the dinner went to support the Adopt-A-School program. Spencer Turcotte and Tyler Bertuzzi working hard at Served by the Storm. November 20th 2011: Storm Players Tanner Richard, Patrick Watling, Tyler Bertuzzi and Zac Leslie along with Spyke and Stormy, walked the Santa Claus Parade and handed out 2000 candy canes! Throughout the school year, Storm players visit elementary schools in Guelph and Wellington County to present the Champions for Education program! October 17th, 2011: Storm Players Garret Sparks, Ryan Horvat, Stephen Gaskin, Francis Menard and Kyle Pereira presented the Champions for Education program at James McQueen Public School in Fergus. After presenting the program, the students at James McQueen challenged the Storm players to a game of floor hockey! October 19th, 2011: Patrick Watling and Zack Mitchell present the FUN FIT program at St. Mary’s Catholic School. Garret Sparks and Kyle Pereira were also at St. Mary’s Catholic School presenting the Read to Succeed program. October 19th 2011: After visiting St. Mary’s Catholic School, Garret Sparks, Patrick Watling, Zack Mitchell and Kyle Pereira travelled to Alma Public School to present the Champions for Education program to some excited students. Pictured is Garret Sparks reading Brady Brady to some excited students! October 12th, 2011: Zack Mitchell and Patrick Watling surprised this excited group of Safety Patrols at their Pizza Lunch! October 25th 2011: Garret Sparks and Kyle Pereira signing autographs for the Safety Patrols at St. Michael Catholic School! October 20th 2011: Spencer Turcotte and Brock McGinn read Hockey Stories to young fans at the Main Branch of the Guelph Public Library! October 13th 2011: Hunter Garlent and Zac Leslie read to young fans at the East Side Branch of the Guelph Public Library. October 22nd 2011: Storm Players Matt Finn, Ben Harpur, Spencer Turcotte and Justin Auger were at Galaxy Cinema on Woodlawn Road bright and early to meet fans, and support Community Day. Spyke and Stormy also were on hand to help out around the Cinema! October 22nd 2011: Storm Players Jason Dickinson, Daniel Poliziani, Tyler Bertuzzi and Mac Nichol helped over 40 eager Storm fans make picture frames at this years Home Depot Craft Workshop at Woodlawn Road in Guelph. October 23rd 2011: Following the Storm game, fans had the chance to skate with the team, take photos and get autographs from their faveourite players! Justin Auger signs a jersey for a young fan! Garret Sparks signs a jersey for a young Storm fan! Storm Players Ryan Horvat, Tanner Richard, Brock McGinn and Ben Harpur were on hand to meet and greet fans at this years Ribfest Weekend. Hunter Garlent and Jason Dickinson also came by to meet fans and demonstrate the popular Top Shot game. Spyke, along with Coach Walker and Storm Players Matt Finn, Zack Leslie, Ben Harpur, Jason Dickinson and Hunter Garlent were on hand to meet and greet fans at the annual Canada Day Celebrtaions! Spyke and Stormy make many community appearances throughout the season, and never miss an oppourtunity to give fans a high five! Please check this page regularly for information, updates and pictures from our events! If you are interested in having us at your event, or you would like to bring your group to a Storm home game, please contact Sarah Twigger at stwigger@guelphstorm.com or by phone at 519-837-9690 ext. 104. Stormy was up bright and early to support Galaxy Cinema’s Community Day! She made sure to high five every fan, and she even managed to get in a game of Air Hockey! Stormy loves hanging out with her mascot friends! She helped Cuppy celebrate the Grand Opening of Booster Juice at Pergola Commons! To view more photos from the Booster Juice Grand Opening, Click Here! Spyke loves being out in the community and meeting his fans! He’s always up for a high five & a dance off!